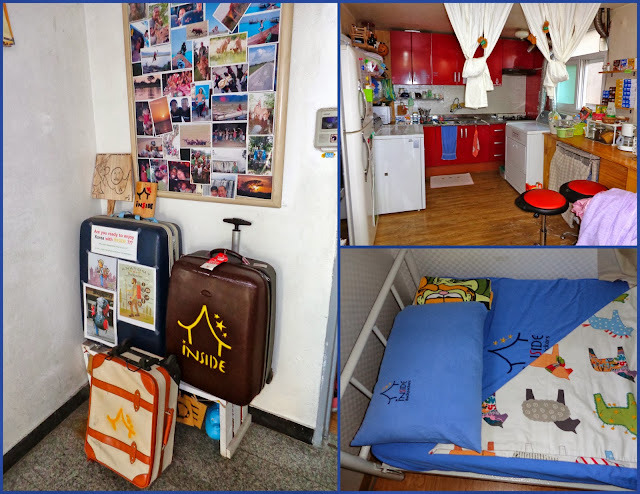 I planned to meet two other UW TTGs in Seoul at 16:00 on Wednesday (September 18) to check into our hostel together. Trying to fight off a recently acquired cold, I stayed in bed most of Wednesday morning. Around 11:45 I put my current location and destination into Google Directions just to see what time the bus left for Seoul. I knew which bus to take -- the same bus I've been taking on Saturdays to get to the city for Korean class -- but I wasn't sure of the schedule on a Wednesday. When I put the two locations into Google Directions, it told me the next bus left at 12:00 on September 21! Then I had a mini freak out, wondering if the buses were stopped because of the holiday. How would I get into Seoul then? I did some googling to see if buses stopped during Chuseok, but I did not find any helpful results. So instead of resting a bit more and watching an episode of Breaking Bad, I hopped in the shower, quickly packed, scribbled down directions to the hostel, and then walked to the bus stop around 12:45 to find out my fate. I won't leave you in suspense; the bus came at 13:00 as I had hoped. It was a huge relief though, because I had my doubts. Later someone told me that Google Directions isn't the best to use in Korea, and that I should be using the Korean bus apps instead. Well, until I get my foreign residency card I'm still without cell phone service. And without a data plan, I'm without handy transportation apps. But now I know not to freak out if Google tells me strange things. When riding the bus to Seoul from my town, I'd begun to use this gate as a landmark that told me my bus stop was coming up. But I didn't know what the architecture actually was. 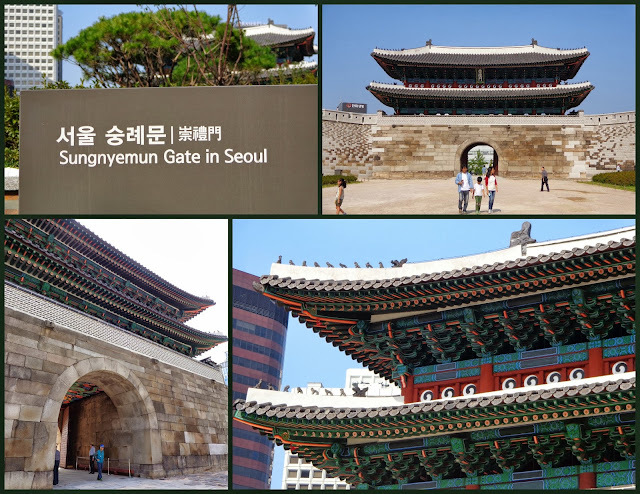 Now I know that this Sungnyemun Gate is one of eight gates in Seoul. These eight gates make up the Fortress Wall that surrounded the city during the Joseon Dynasty (1392-1897). The part that stuck out to me the most in the blurb I read about the gate was that in 2008 an arsonist severely damaged the wooden pagoda that sits on top of the gate. It just reopened in May of this year (2013) after a five-year restoration project. After leaving our stuff in our private room we wandered around looking for somewhere to eat. We ended up at a BBQ chicken place right next to our hostel. 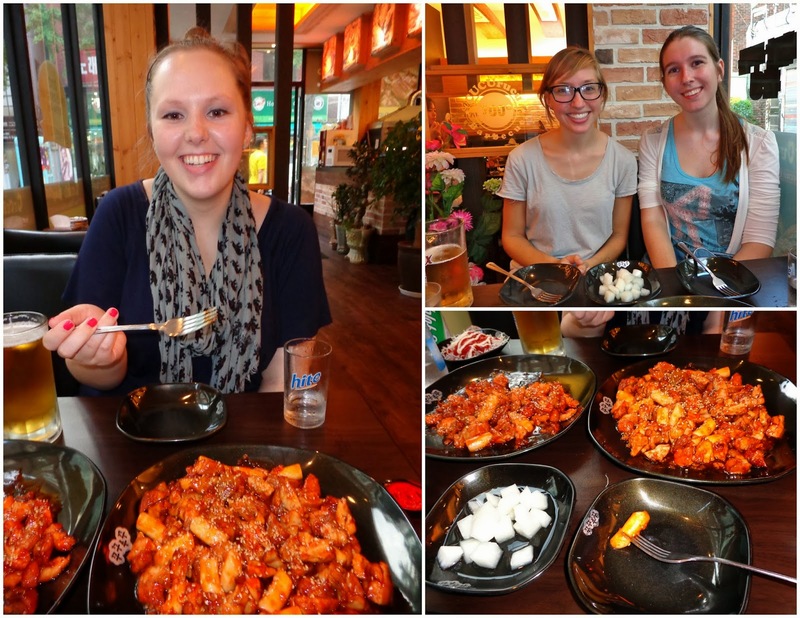 (BBQ chicken is a thing here in Korea, by the way -- they make really delicious BBQ). It was waay pricier than that kimbap meal I had the week before, but it was sure tasty. After dinner we hurried off to the metro and headed towards the World Cup Stadium. Earlier that week a fellow TTG had posted in our facebook group that she and some friends were going to the soccer game that Wednesday night, did anyone else want to come? So we chimed in and she bought tickets for all of us. 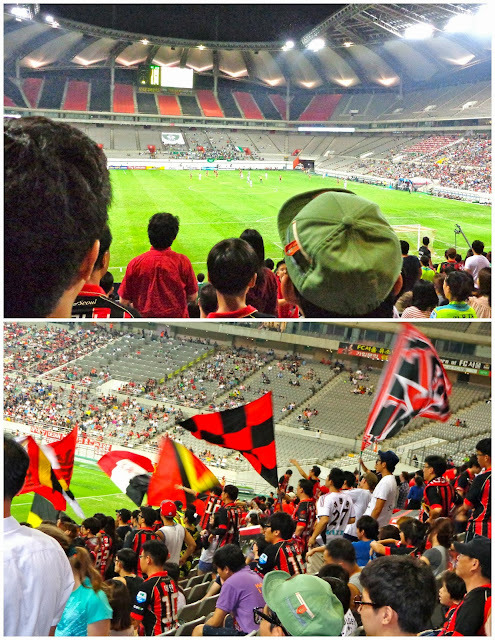 This was my second soccer game that I went to; the first was in Madrid in 2009. We semi-went out after the game, but not really. We went to two different bars, so with those plus the soccer game I had about three drinks over a span of 5 - 6 hours. Yeah. I don't think we got back to the hostel until 1:30 or 2 in the morning (we took a taxi -- they're cheap here in comparison to back home), so Reca was tired (and still recovering from that cold). Hi there! Yes, most places are closed during Chuseok, but you will still be able to find something to eat and do for two days!